This morning, The Cat was looking through one of her Chinese food books and got in the mood shoyu pork. Shoyu pork is one of her favorite comfort foods from Shanghai. 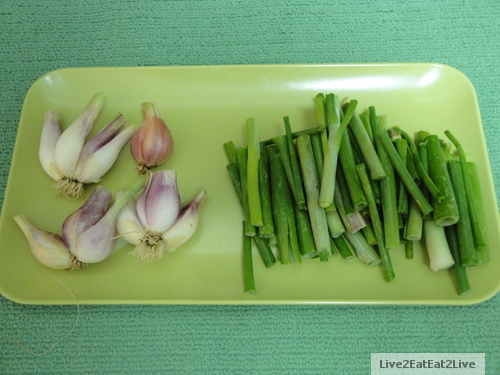 She said usually, a small amount of green onion is used. But The Cat said that as a variation, more green onions could be added. 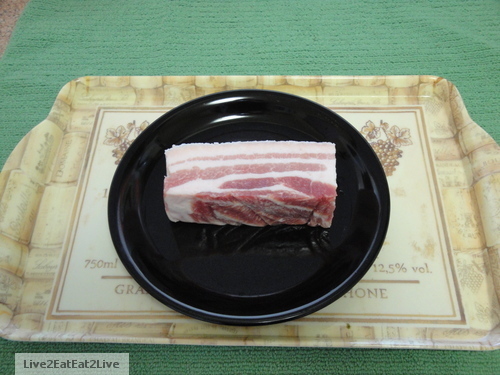 At the Korean supermarket, I bought pork belly sold in slabs. This slab is about eight ounces and about one and half inches thick. 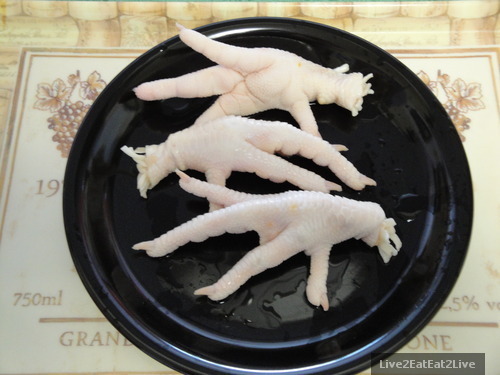 I also bought chicken feet at the Japanese supermarket. In the next few days, I will be making shoyu pork and chicken feet soup; the results will posted. Our friend, the same one that gave us the eggplants last weekend, also gave us a whole bunch (no pun intended) of green onions. The Cat helped to clean and cut them up. I’m not sure what to do with so much green onions yet (that’s why I’m not an Iron Chef). Going to the market(s) tomorrow to get some inspiration. Wish us luck. The Cat was teary (from the onions). 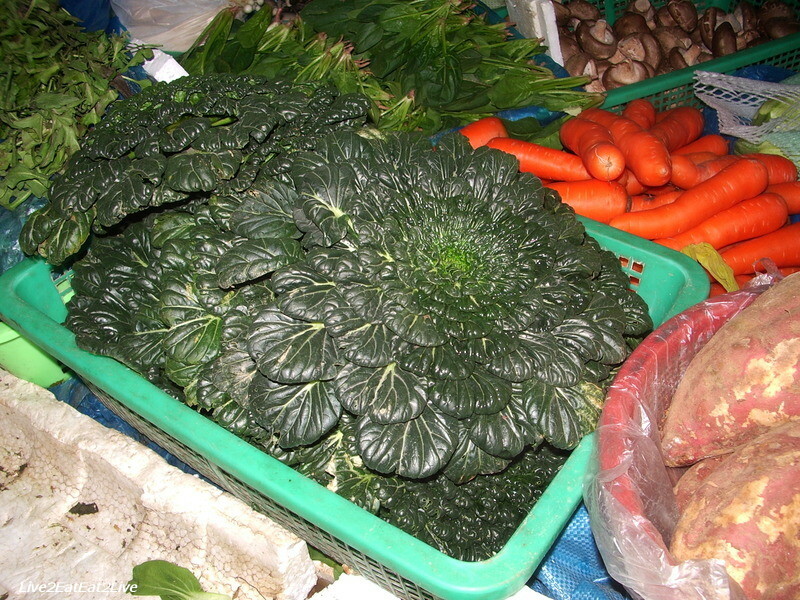 I saw this cabbage the last time we were in Shanghai, winter 2008. It’s called “ta ku cai” (cai sounds like “tsai”). The Cat said it was a winter vegetable that tastes sweeter after a frost. After seeing it in the marketplace, The Cat’s cousin ordered it for dinner. 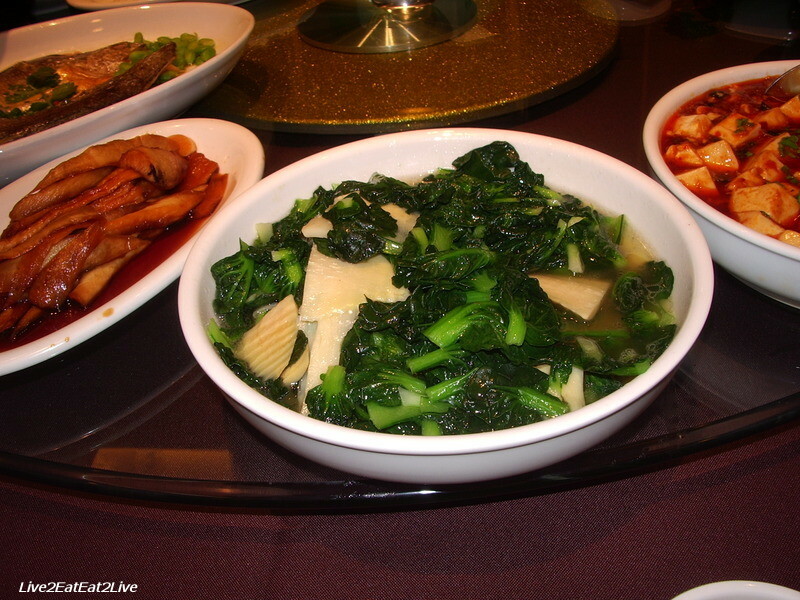 Although the picture looks like it was in soup, it was just how the restaurant cooked it (soupy). The taste was definitely on the sweeter side (in a vegetable sort of way) and the texture was kind of like Shanghai cabbage here at home. Our friend gave us some Japanese eggplant from her garden. Since The Cat was coming home late last night I decided to make a light dinner. 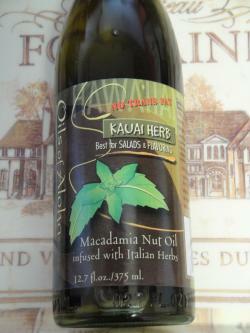 Cook orzo according to package directions, drain, and drizzle macadamia nut oil, toss to coat. Topped with eggplants, stewed with tomatoes and mushrooms (salt and sugar to taste). Added soft fried egg. The egg yolk was broken to create a sauce for the orzo. 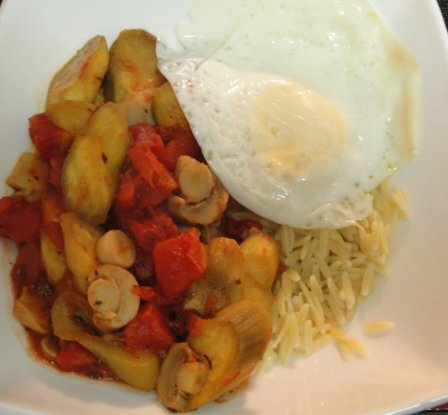 Stewed Eggplant with Orzo and Fried Egg. The Cat likes Eggplant and Eggs. Food. Extremely high on my priority list. I’ve been interested in cooking for a long time. I think it was because my mother couldn’t cook. Let me rephrase that. She could cook, but choose not to cook well. One summer, I took a beginner cooking course. That was it. The fire was lit and I saw the possibility of food. My eating philosophy went from “eating to live” to living to eat.” Since then my thinking has changed to embrace both. Living to eat is self-explanatory. Eating to live is finding foods and ingredients that can contribute to a healthier and happier (within legal limits) life. 🙂 Instead of choosing one or the other, I choose both. There have been numerous influences and inspirations along the journey. Hopefully this blog will pay homage to many (if not all) of them. This blog is mainly about my thoughts, experiments, triumphs, and failures related to food (there may be sidetracks and tangents along the way). If you want more information on any of the pages or posts, leave a comment, I’ll get back to you. Hopefully you enjoy the journey. If not, that’s okay too.